One of the Cards’ two third-round draft choices in 1987 (62nd overall), it was hoped that Awalt would be able to compete against veteran TE Doug Marsh and backup Jay Novacek. When Novacek went down with an injury, he started nine games in the strike-interrupted season. Cardinals went 7-8 in the strike-shortened season (three games were played with replacement players) to finish third in the NFC East. The franchise moved west to Phoenix in 1988 and, while his production dropped due to splitting time with Novacek and battling a foot injury, Awalt had a good year with 39 catches for 454 yards and four TDs. There were concerns about his blocking, but he was a sure-handed receiver and caught another 33 passes for 360 yards in ’89. 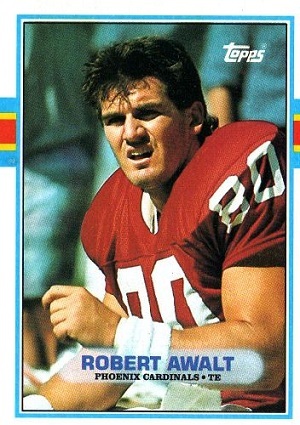 Initially slated to be shifted to H-back in 1990, Awalt instead was dealt to the Dallas Cowboys and settled into a backup role. He caught 18 passes in two seasons and moved on to Buffalo, where he had six catches in 1992 and ’93. For his seven-season career, he caught 138 passes for 1583 yards (11.5 avg.) and 10 touchdowns. Awalt’s first year remained his best.